Founded in 1988, Axiom Corporation is a management and technology consulting company providing information technology, professional, and health/medical support services to the federal government, Department of Defense and corporate entities. Axiom Corporation has successfully supported numerous clients’ needs in IT, technical, project management, administrative, logistics, health/medical, clinical research, planning, training, and more. We have worked to stand up new initiatives and to improve existing programs. We are accustomed to working with organizations with special privacy and security requirements, including medical settings and military installations. We have a very strong past performance history and long-standing client relationships. We pride ourselves on having a keen sense of urgency and excellent customer service, building lasting relationships, and bringing on talented staff members, team members and partners who are among the best in their fields. Our company tagline is “High Performing, Low Maintenance.” and we take it to heart. Axiom Corporation strives to be a company that delivers an outstanding work product yet does not require a lot of maintenance from our clients. Our goal is to make our clients’ jobs easier, not more difficult. Axiom Corporation is certified by the SBA as an 8(a) company and a Small Disadvantaged Business (SDB). 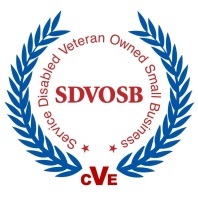 We are also a verified Veterans Affairs (VA) Service Disabled Veteran Owned Small Business (SDVOSB).